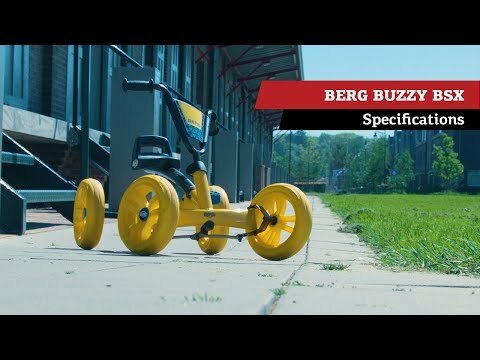 Get your first pedal experience on a BERG Buzzy BSX - learning to pedal has never been easier! This super cool yellow sensation on four wheels is much sturdier than a three-wheeler. Very simple to use, your feet remain firmly on the pedals even round sharp corners. Using handlebars rather than a steering wheel helps younger children quickly learn to steer and pedal at the same time. The perfect first pedal experience, helping with development of spacial awareness and hand eye coordination. Compact, lightweight & durable, the seat and steering wheel are adjustable, giving years of pleasure on this smart new four-wheeler!